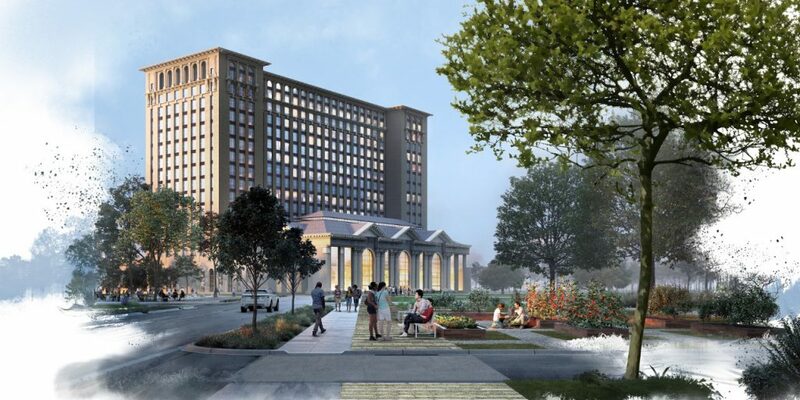 Ford has been working hard to revitalize an iconic part of Detroit heritage with its $90 million purchase of Michigan Central Station in Detroit, Michigan. Ford purchased the derelict, monster of a building that has stood for 104-years and was originally train station in May of 2018. Ford announced at the time that the gigantic 600,000 square foot property would be used to house 313,000 square foot of office space, 60,000 square feet of event space, 43,000 square feet of commercial space, and 42,000 square feet of residential space broken into 40 units. People in the Detroit community wanting to get closer to the iconic building that Ford is revitalizing will be able to when Ford hosts a free 10-day Winter Festival outside the building starting on January 18. The event is planned to coincide with the North American International Auto Show. The Winter Festival will include live music and art along with a slick 3D light show to be the highlight of the event. Ford also hosted a Halloween event at Michigan Central Station at the end of October, also with a light show. The light show will be projected onto the facade of the iconic 18-story structure that Ford is revitalizing. Part of the 3D light show will include projecting images of the heyday of the station onto its surface reports Click On Detroit. Ford’s event highlight will also share pictures of the revitalization of the structure along with images of what Ford plans to do with the landmark in the future. The light show will play three times per hour, and in between those times, the building will serve as the backdrop for the work of local artists. Other events that visitors can enjoy during the festival include graffiti painting, live performances, s’mores, food trucks, beverage stations, ice carvings, vendor booths, kids’ activities, and an exhibit on the history of the building and artifacts curated by the Detroit Historical Society. Events at the festival will be held January 18-27 from 5:30-10 p.m. on Fridays and Saturdays, and from 5:30-9: 00 p.m. from Sunday through Thursday. The event will run until 10 p.m. on Sunday, January 20. Ford has received lots of support from the Detroit community for its Central Station revitalization project, including massive tax breaks and subsidies from the City of Detroit to the tune of $207 million. The tax breaks will eliminate real and personal property taxes for the next three decades on the property, except for debt mills, city corporate income tax, and utility users tax. The city expects to recoup the funds Ford won’t have to pay from the personal income taxes of the 5,000 workers who will be employed there. Ford plans to have Detroit Central Station completed by 2022; the completion will include the original Central Station Clock that was stolen from the building two decades ago and was returned by the unknown thief when word of Ford’s revitalization plans surfaced.